ATEME: satellite broadcast video encoder/decoder. Paris, October 2014 – In support of the 2014 Asian Games which were broadcast from Incheon, South Korea from September 19 to October 4, 2014, ATEME announced that it had again been selected by Globecast to deliver a turnkey video head end platform to provide live content to leading Hong Kong cable operator, Hong Kong Cable Television ("CABLE TV"). ATEME was chosen for its technical expertise, affordable turnkey solution and on-the-ground support. 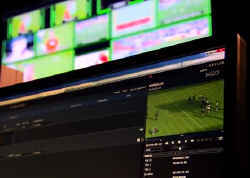 Globecast, a subsidiary of France Telecom/Orange, broadcasts content from the biggest news and sporting events each year. It looked to ATEME to provide a turnkey solution for a temporary platform that it used to broadcast content for the duration of the games. Globecast relied on ATEME’s operations center in Seoul, Korea to provide support throughout the event, after which the platform will be transferred to its Singapore location to be re-deployed for other projects. David Gerbaulet, presales project manager, Globecast, said: "Building a turn-key solution to support our partners in the broadcast of this high-profile event required extensive experience and equipment with advanced features. Our work with ATEME during previous high-profile events, its technical expertise and reliable technical support provided us with an advantage over our competition and allows us to deliver the high-quality broadcasts our customers rely upon." Kyrion DR5000 decoder – Hardware integrated receiver decoder dedicated to professional contribution over satellite and IP/ASI networks. It is designed to handle all MPEG flavors with up to 128 presets, allowing the operation room to receive any professional video feed. Visit http://ateme.com/en/products/Integrated-Receiver-Decoders/dr5000 to learn more.